My wife and I recently bought two potatoes to try it out and I’m happy to report the chips turned out well, although it did take some trial and error. TopChips is basically two rubber dishes with holes in them that can be stacked one on top of the other. 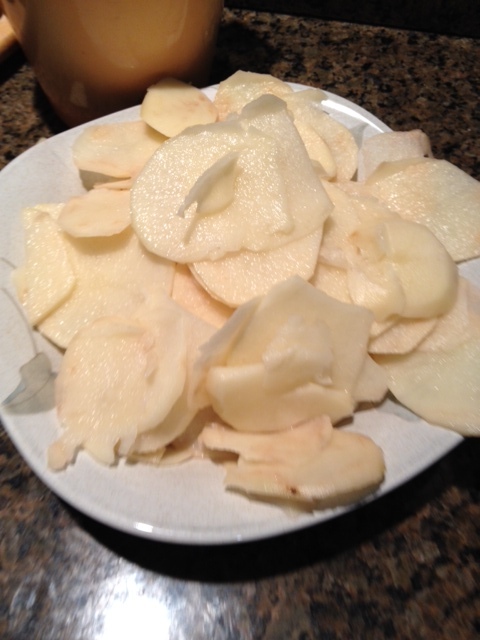 You use a food slicer, or a knife if you prefer, to make thin slices of potato and then lay them on each plate. 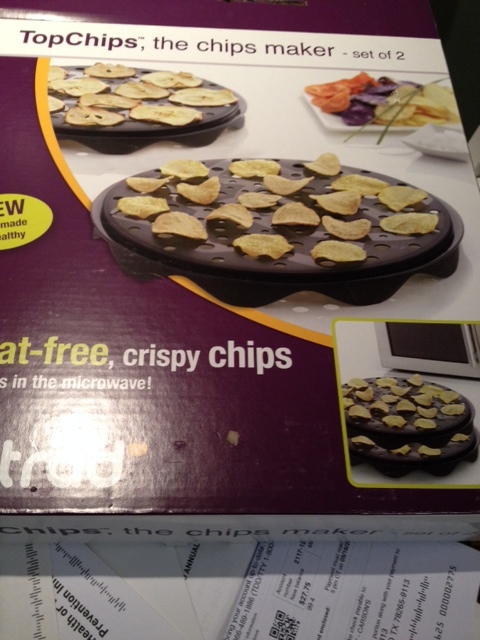 The instructions recommended three minutes but I found our micro needed five minutes to get the chips crispy. At five minutes a tray, it took quite some time to make two potatoes worth of chips. And you have to move fast because potatoes start to turn brown once you slice them, or skin them for that matter. I suppose we should have put the slices in water to prevent that but I was worried about them becoming so wet they would take even longer to cook. Start by thinly slicing a potato. 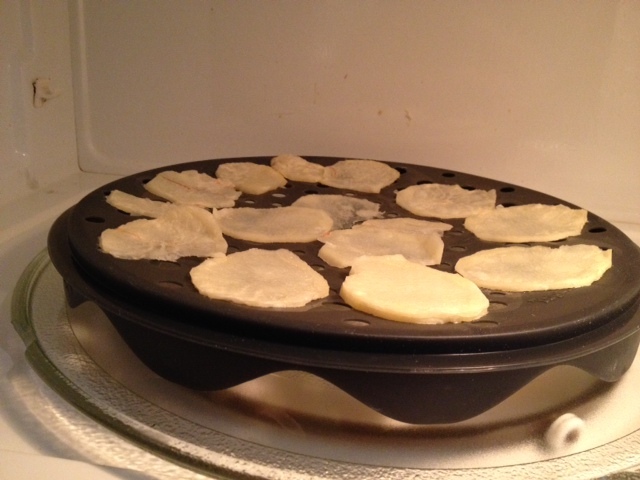 …then layer the slices on the TopChips cooking dish. Instructions say you can use TopChips with carrots, sweet potatoes, apples, pears and mangos. I’m sticking with potato chips. Given how long they take, I don’t think I’ll be making them to share with others at parties. These are going to be my treasure when I get the chip urge. 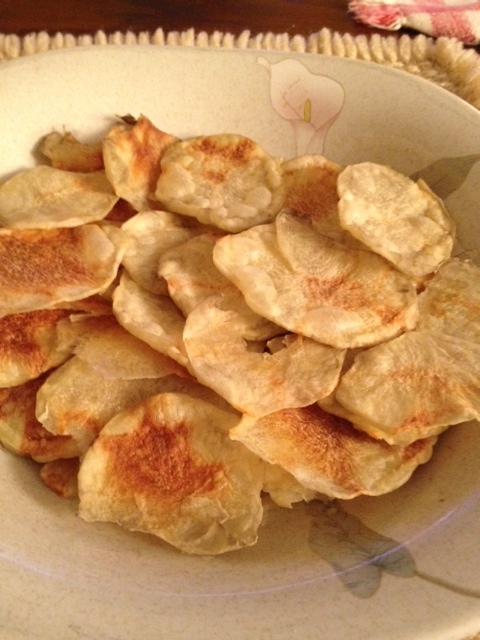 And the result is tasty chips with no salt and no fat.